On his 22nd birthday, Joba Chamberlain picked up his first career save as the Yankees beat the Toronto Blue Jays 7-5 Sunday afternoon at Yankee stadium. Behind a strong performance by Mike Mussina the bombers were able to reduce their magic number to clinch the wild-card to two games and put themselves 1 ½ games behind the Boston Red Sox for the American League East lead. The Yankees played small ball on offense with 11 singles and nine walks and only one extra-base hit during the game. Jose Molina had the only double as he went 3-4 with three RBI’s playing as the regular catcher Jorge Posada got the day off. Toronto got on the board first in the top of the second inning when left-fielder Adam Lind got up with runners on second and third and doubled to left field to put the Jays up 2-0. The next batter, Curtis Thigpen, singled to center which put his team up by three runs early. Too many walks lead to the downfall of Blue Jay’s starter Dustin McGowan as the Yankees were able to mount a two-out rally in the bottom of the second because of free passes to Hideki Matsui and Robinson Cano. With two-out and two on the Yankees successive RBI singles from Molina, Johnny Damon, and Derek Jeter to tie the game at three. In the top of the forth inning John McDonald nearly put the Blue Jays back on top after a single to center, but Melky Cabrera fielded the ball barehanded and threw it into Cano who made a great relay throw to get Greg Zaun at the plate to end the inning. That play seemed to spark something in Mussina who retired the side in order during the fifth, sixth, and seventh innings. He struck out three batters as he made quick work of all of the last nine batters he faced. In the bottom of the fifth it was the base-on-balls which got to McGowan again. He walked Bobby Abreu and Alex Rodriguez to lead off the inning then with one out Cano singled to right field which drove in Abreu and knocked McGowan out of the game. Two batters later Arod was able to come around and score on Doug Mientkiewics’ infield single to third base. 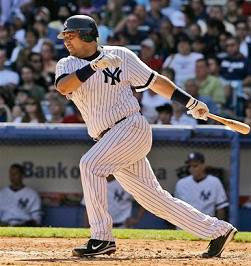 The following hitter, Jose Molina, put the Yankees up 6-3 with a single to center which plated Cano. Molina added his third hit in the seventh against Josh Banks. It was an RBI double hit to deep right field which scored Matsui who had previously reached on a walk. The run seemed like a tack-on run at the time but it turned out to be an important one as Luis Vizcaino allowed a two-run homerun to Matt Stairs in the top half of the eight which shortened the Yankee lead to 7-5. 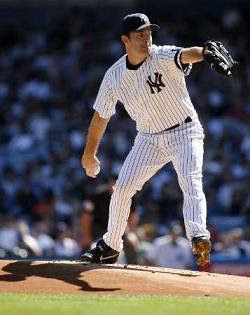 The Yankees then proceeded to break their self-imposed “Joba Rules” which are meant to protect his arm from strain. The rules were broken when they not only brought him in the game in the middle of an inning, but with runners on base as well. Both are no-no’s according to the Yankees Minor League Pitching Coordinator Nardi Contreras who came up with the rules. But the strategy paid off as Joba struck-out Adam Lind to escape trouble. After pitching in back-to-back games Friday and Saturday night Mariano Rivera did not come into the game for the ninth inning dispite it being a save situation and instead Joba stayed in the game. The inning didn’t last long as Chamberlain got the first batter to hit it weakly back to the mound then struck-out the next two batters to en d the game and earn his first save. Read more all of my work and more at Hot Stove New York.